Not all of us are morning people. We can’t just pop out of bed, tear open the curtains, and greet the day with a rosy smile on our face. In order to even completely open our eyes, some of us need to slowly sip a cup a hot cup of coffee. We need that jolt of caffeine before we are ready to shave, shower, and get in our cars as we head to our 9-to-5 cubicle jobs. But according to a recent survey, some of us would even give up our significant other or stop showering if it meant we could have that mug of sweet sweet java. Thanks to a Nestlé and Morning Consult poll, we know that people love coffee so much that they have no qualms about bringing it into the bathroom or the shower (we’d prefer a shower beer but that’s just us). Morning Consult interviewed 2,199 coffee fanatics through an online poll from Sept. 18 through Sept. 19 in an effort to find out what exactly drinkers were willing to give up to get a steaming hot cup of joe and and what strange hobbies they do while drinking coffee. The survey was done in honor of National Coffee Day (Sept. 29) and proved that people are willing to give up just about anything to get their caffeine fix. Unsurprisingly, of those polled, two out of three drank coffee every day and 86 percent drank coffee at least once per week. In our opinion, you’re barely a coffee drinker if you only have one cup per week. That’s about 24 fewer cups (in our unscientific estimate) than we need to start our engines. The survey showed a handful of surprising statistics, such as: 62 percent of drinkers said they literally can’t function without coffee. Almost half said they would rather not talk to anyone before imbibing their first cup. 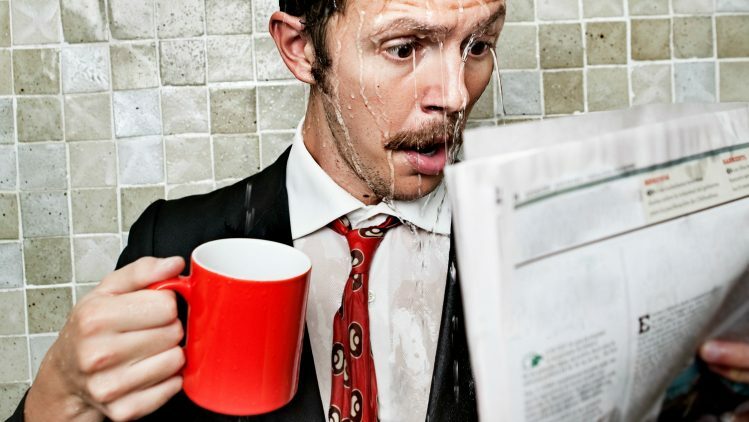 Forty-one percent admitted that they drink coffee in the bathroom or shower. Almost half of those surveyed claimed they would give up TV for a week before giving up coffee and 36 percent said they would give up the internet for a week before giving up coffee. The most noteworthy statistic involved love and hygiene: 29 percent of drinkers said they would give up spending time with their significant other for a week before giving up coffee! A quarter of those surveyed said they would rather go without a shower for a week than live without their morning fix. Now that’s dedication.